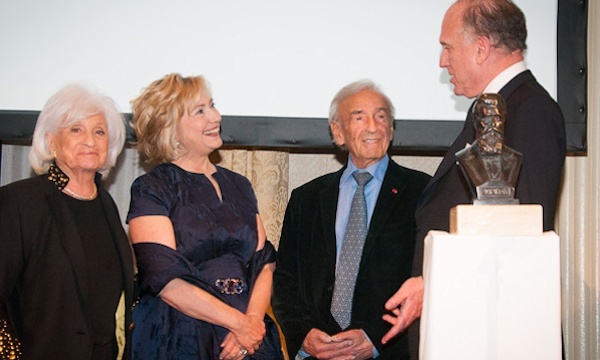 NEW YORK – Former US Secretary of State Hillary Rodham Clinton, Israeli Minister Silvan Shalom and 250 guests attended a gala dinner at New York’s Waldorf Astoria Hotel on Tuesday night at which the World Jewish Congress honored the writer and Nobel Peace Prize laureate Elie Wiesel and his wife, Marion, with the organization’s Theodor Herzl Award for their lifetime achievements. The Wiesels established the Elie Wiesel Foundation for Humanity after Elie was awarded the Nobel Peace Peace Prize in 1986. The foundation’s mission is to combat indifference, intolerance and injustice through international dialogue and youth-focused programs. Elie Wiesel, whose ground-breaking memoir ‘Night’ brought the experience of Holocaust survivors into world consciousness, is the author of more than 60 works of fiction and non-fiction. Theodor Herzl was the father of modern political Zionism. Established in 2012, the WJC’s Theodor Herzl Award recognizes individuals who carry forward Herzl’s ideals for a safer, more tolerant world through international support for Israel and enhanced understanding of Jewish history, culture and peoplehood. Israeli President Shimon Peres was the first recipient of the award.